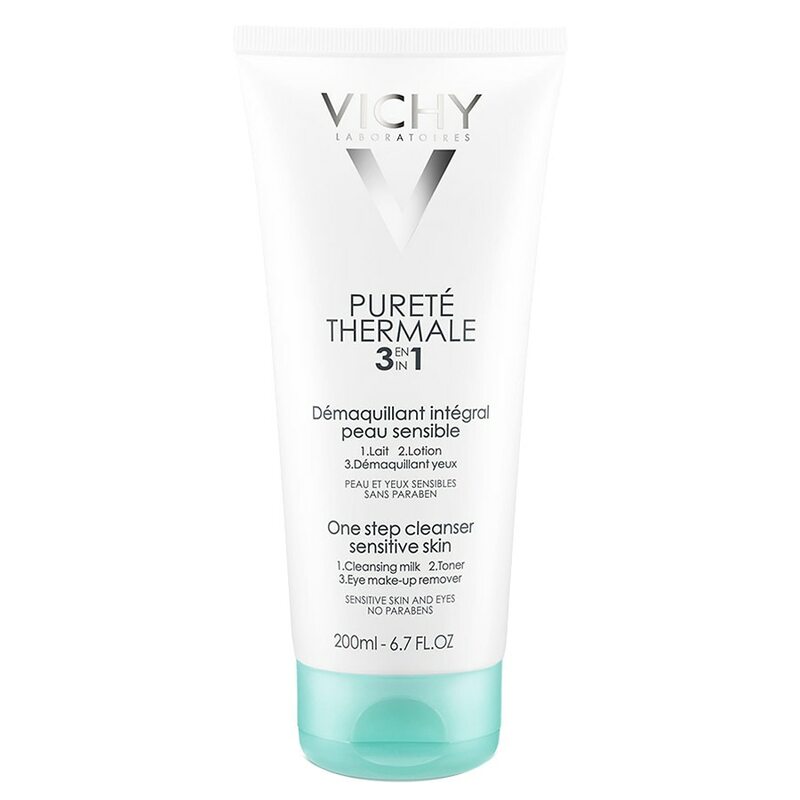 Vichy Purete Thermale 3-in-1 One Step Face Cleanser and Makeup Remover is an ultra-quick and practical cleanser for sensitive skin. This face wash cleanses and removes all traces of makeup, dirt and pollution in one simple step. It combines the efficacy of a milk + a toner + an eye make-up remover in a single step. It is perfect in the evening, ideal for a busy lifestyle. This facial cleanser leaves skin feeling fresh, soft and soothed. This facial cleanser is formulated with Captelae, a natural detoxifying agent originating from shea cake, which reinforces cutaneous resistance to damaging external factors. Due to its richness in polyphenolscapable it has the ability of trapping metals and neutralizing them. Demonstrated detoxifying efficacy. Vichy Mineralizing Water, a miracle of nature from the preserved region of Auvergne, rich in 15 minerals, helps strengthen the skin's moisture barrier function to help protect skin against aggressors. Proven efficacy on cleansing 2.5pm pollutant particles thanks to its formula enriched with a Shea extract, Captelae. Its anti-pollution cleansing efficacy is 72%* superior to that of a traditional water-based cleansing. With cotton wool: Generously soak two cotton pads in Purete Thermale make-up remover before gliding them over both sides of the face simultaneously, in circular strokes, working from the inside outwards and from the chin up to the forehead. Finish off with the neck. Manual massage: Apply product to the face before sweeping one hand after the other up towards the forehead on either side of the nose. Use the palms and the full length of the fingers. Repeat three times. Finish with soft strokes from the sides of the face towards the neck.